Sister Suffragette, originally uploaded by Scott Thomas Photography. This lovely suffragette told me she would be the first Lady Mayor of Main Street USA as soon as women won the right to vote. 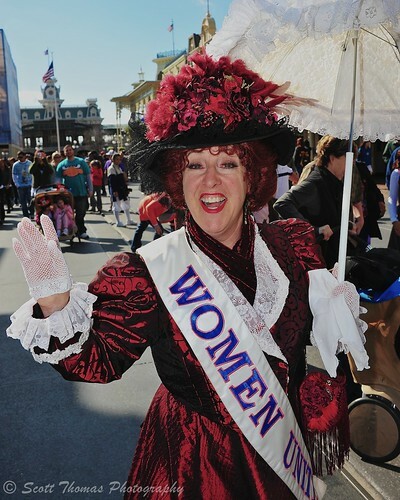 She is one of several period cast members who roam the Magic Kingdom’s Main Street USA in Walt Disney World interacting with guests as they would in the early 20th century. After writing yesterday’s post on the first Women’s Rights Convention, I thought this photo would be a fun follow up. This suffragette reminded me of another Disney character from the movie, Mary Poppins. You do remember Mrs. Banks? This entry was posted in Travel and tagged cast member, flickr, florida, history, magic kingdom, main street usa, orlando, reenactor, suffragette, walt disney world, woman, women's rights. Bookmark the permalink.